Ford's all-new Transit Connect is on the way later this year. Ford say that it offers class-leading fuel efficiency and load carrying and durability. 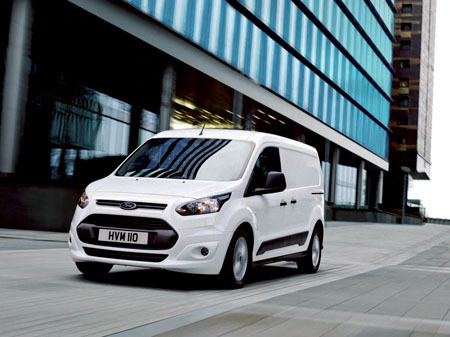 The new Transit Connect joins the all-new Transit range - Ford’s most comprehensive ever line-up of Transit commercial vehicles, which combine outstanding functionality and cost-of-ownership with advanced technologies. This latest Ford Transit Connect will be sold alongside the multi-award-winning Transit Custom and the forthcoming Transit Courier and two-tonne Transit to be launched in 2014. Developed under the One Ford global product strategy at Ford’s commercial vehicle centre of excellence in Dunton, Essex, the all-new Transit Connect will be produced at Ford’s state-of-the-art manufacturing plant in Valencia, Spain for sale across Europe and other worldwide markets. It should be available in van, double-cab-in-van and kombi bodystyles with short-wheelbase (L1 ) and long-wheelbase (L2 ) versions. And it offers a spacious and practical load area with total volumes of 2.9m3 and 3.6m3 with a full bulkhead, or 3.7m3 and 4.4m3 including the front loadspace area (L1/L2, measured to SAE ). The new vehicle can carry payloads of up to 1,000kg matching best-in-class figures. A load-through hatch in the bulkhead and fold-flat passenger seat enable long loads up to 3.0m (L1 ) and 3.4m (L2 ) to be safely carried in the vehicle. In addition, a multi-fold dual passenger seat now enables van models to carry up to three people in the cab. With a width between the wheelarches of 1,226mm, both models can accommodate two Europallets in the load area. Ford claim that the new Transit Connect delivers best-in-class fuel efficiency, with the ECOnetic model capable of 70.6 mpg and CO2 emissions of 105g/km* when fitted with a fixed 62mph speed limiter (with other fixed and switchable speed limiters available as options ) - a 34 per cent improvement versus the current model. And Ford also say that further improvements in routine servicing and maintenance costs also ensure that the new Transit Connect delivers significant savings in overall cost of ownership. Ford boast that unlike many rivals which are tested like passenger cars, the all-new Transit Connect has been subjected to Ford’s ultra-stringent commercial vehicle testing and durability standards, covering the equivalent of three million miles in arduous testing, including at least 250,000 miles in tough real-world fleet conditions. The all-new model also builds on the Transit Connect’s reputation for outstanding security. The improved remote locking system now offers two frequency channels for enhanced security and can be fully configured to the customer’s needs, while anti-tamper shielding of the door lock latches prevents destruction of the locks by drilling or chiselling. The new model offers a stylish and spacious cockpit with car-like design and craftsmanship, smart stowage solutions, and the latest Ford driver assistance features and interior technologies.